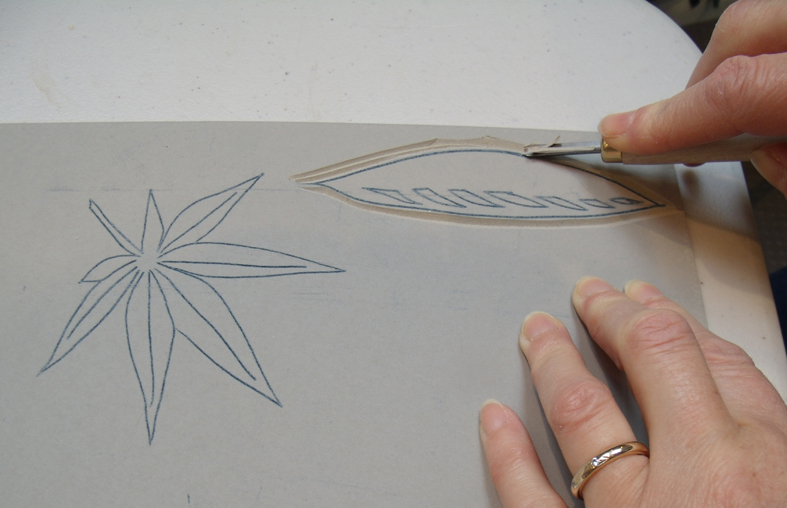 I haven’t cut and printed Lino for oh…..well, since I left art college in the late 1960’s, so that’s almost………. lets’ move on! Checking out our really popular Lino Printing on Linen workshop at Heart Space Studios, run by Jacqui Watkins, I had an overwhelming urge to join in – the sensuous feel of cutting through lino really appeals to me as it is another form of drawing – but the transformation when the block is printed is almost miraculous. 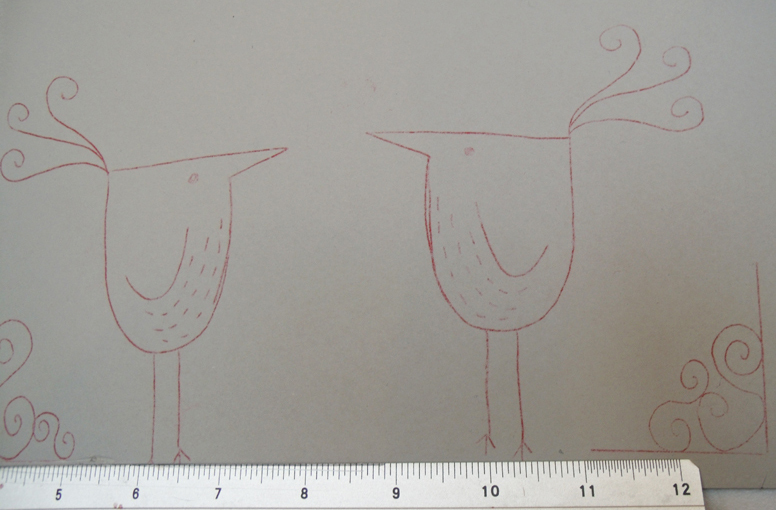 Jackie had asked people to bring in some simple linear images or their own drawings to work with, the first cuts were quickly sampled and assessed..
first sample print from the cut lino bird drawing. 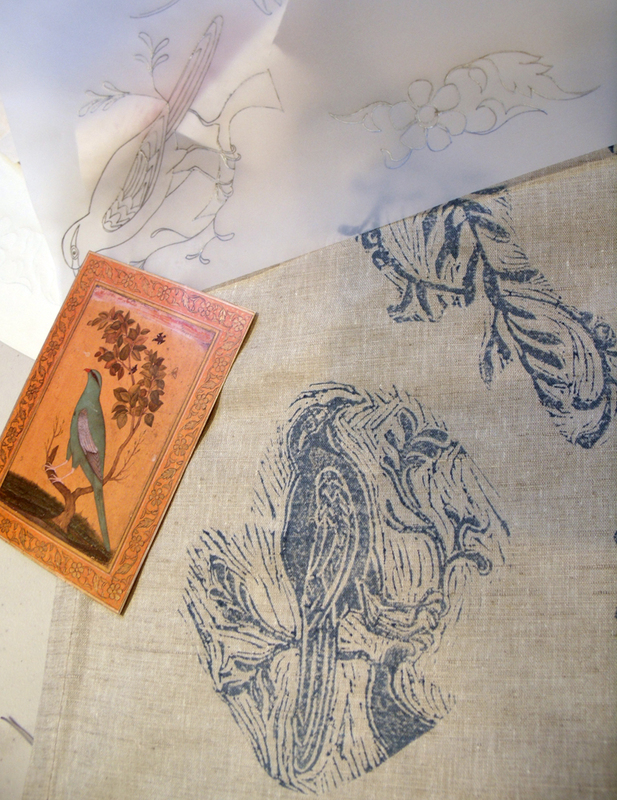 then different colours and fabrics were printed…it is such an immediate technique. strike-offs of the bird block. 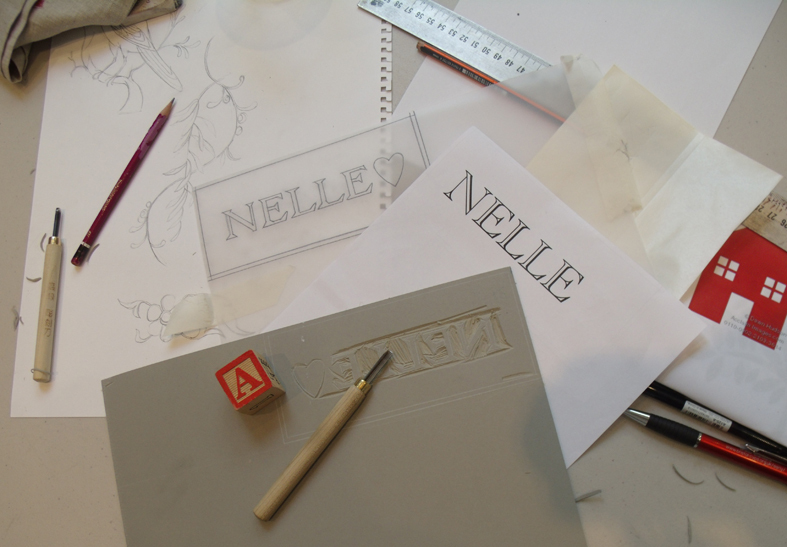 tracing for a child’s name and the resulting cut block – back to front don’t forget! and the joy of the first sample print – magical…. 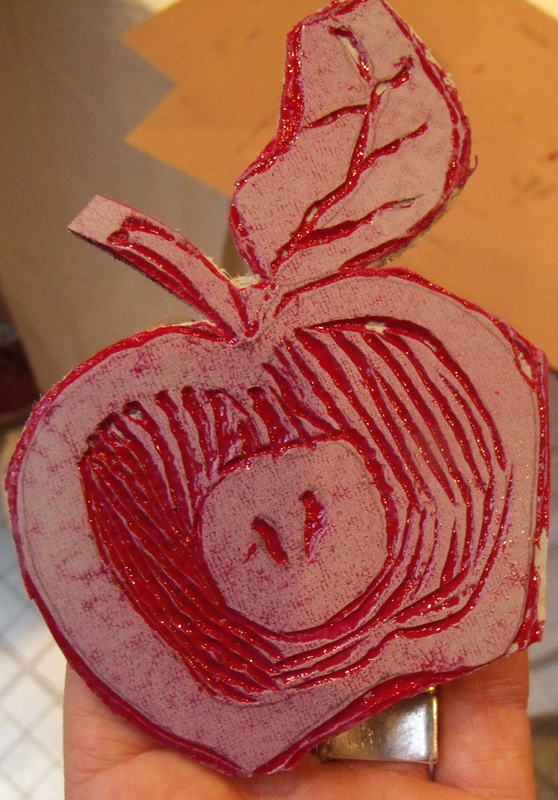 Da Da….first sample print…easy peasy! 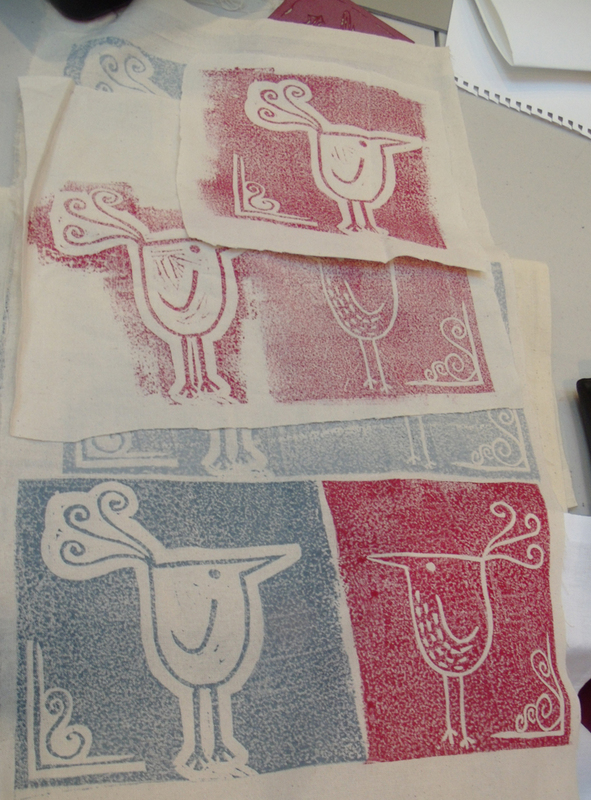 it usually needs a bit of tweaking to arrive at the finished result – to print a personalised kit bag for a daughter to take to school..
Jacqui had brought several samples of her own prints to show that just small simple motifs can be placed together to suggest movement in the birds for example. 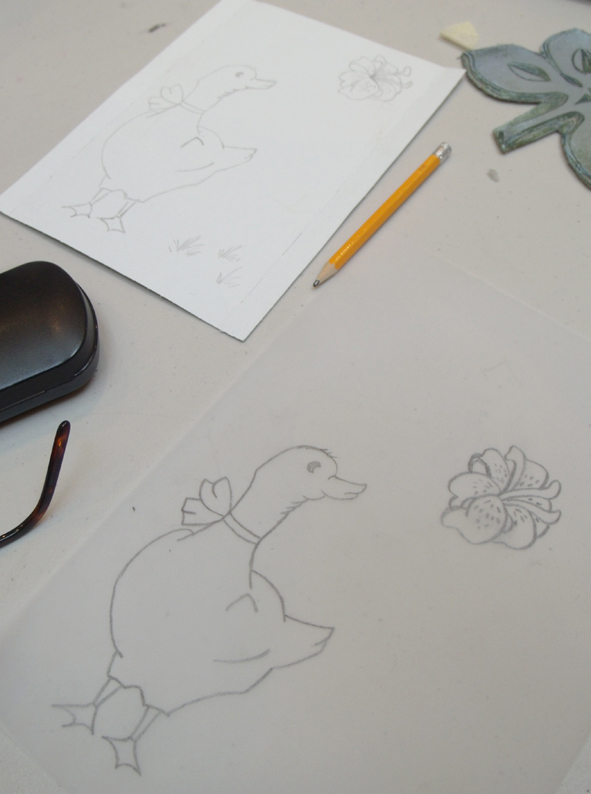 Brilliant for beginners to just work on a few small images to gain confidence. sample swatch of small stuff ready to be assembled into different designs. 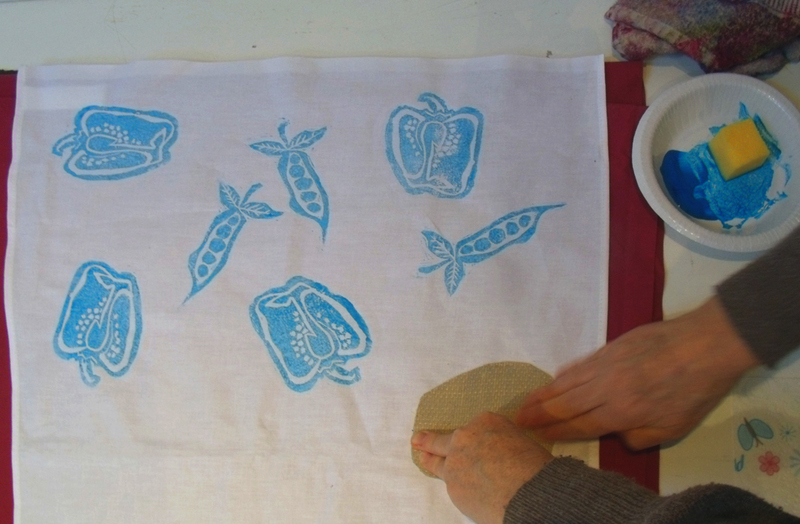 Looking round the I spied a drawing that was a very popular as a textile motif when I was an Art ‘A’ level student…half a pepper…but so retro now! 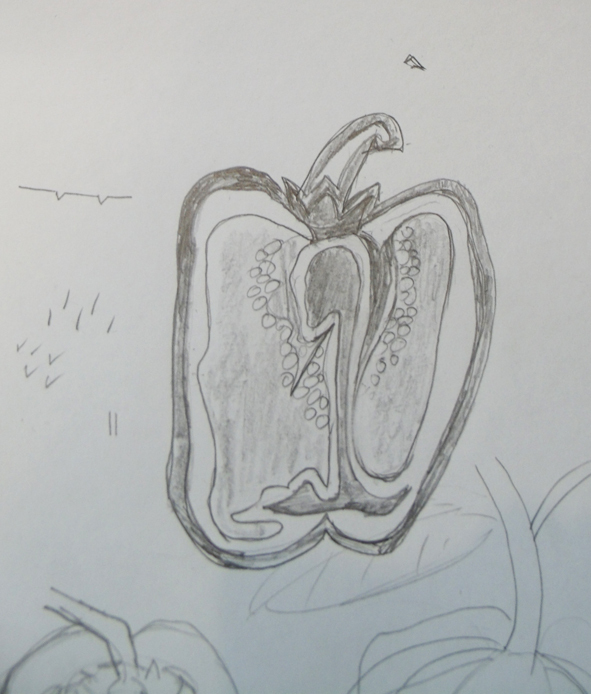 I did wonder how the student would manage to overcome the solid shape; pepper insides are fascinating and intricate to draw, but a bit of a lumpen shape outside. when translated into a solid shape that carries the texture of the lino surface with the marks left from cutting away the ground, form a lively visual combination . 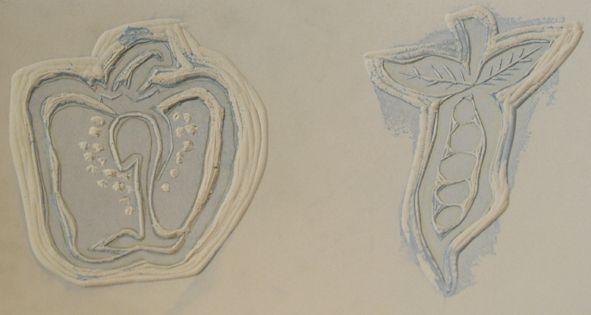 just printed lino block with marks made by linen weave on the solid areas. and looking at the freshly printed surface of the linen weave still apparent on the block above, you can see how this happens. 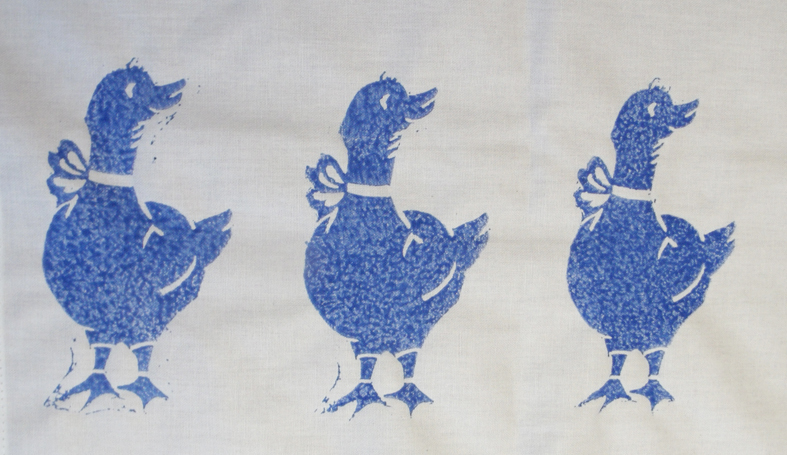 Next time the block is ink rolled and placed on a fresh area of linen the results will be different. Meanwhile one of the students really took advantage of another result of hand block printing – the intentional inclusion of the cut away surface of the background..
original card of bird image with tracing and eventual print. as can be seen below, the different stages of printing on different surfaces, on the upper left is the first print with a mottled background, the red and other blue print shows the background cut marks have been rendered in a rhythmical pattern to further enhance the whole image. 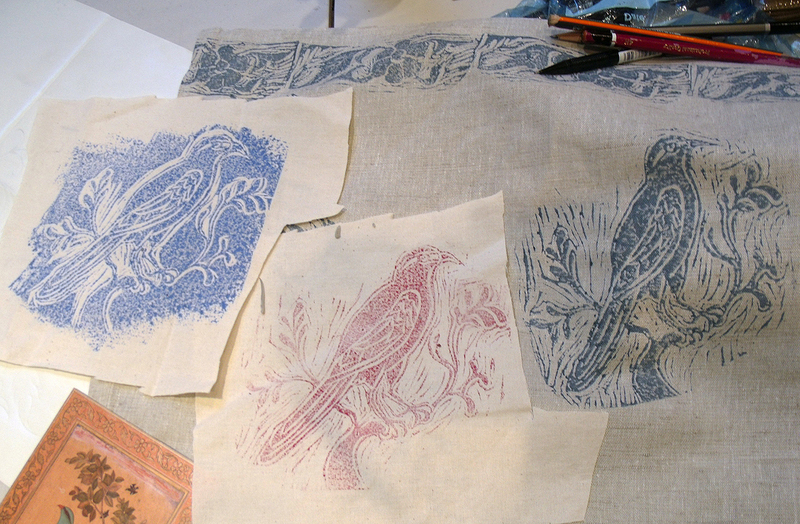 various stages of print backgrounds for this bird and branch design. 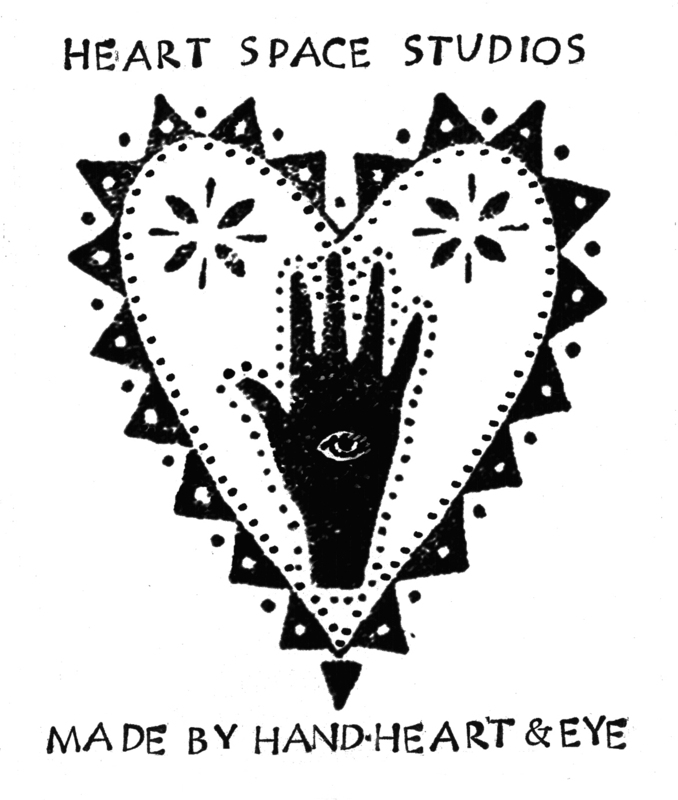 I am hoping to resurrect my lino printing by making a block of the Heart Hand and Eye symbols that I use for the Heart Space Studio logo, this is from a tiny rubber stamp adapted from a commercial design. 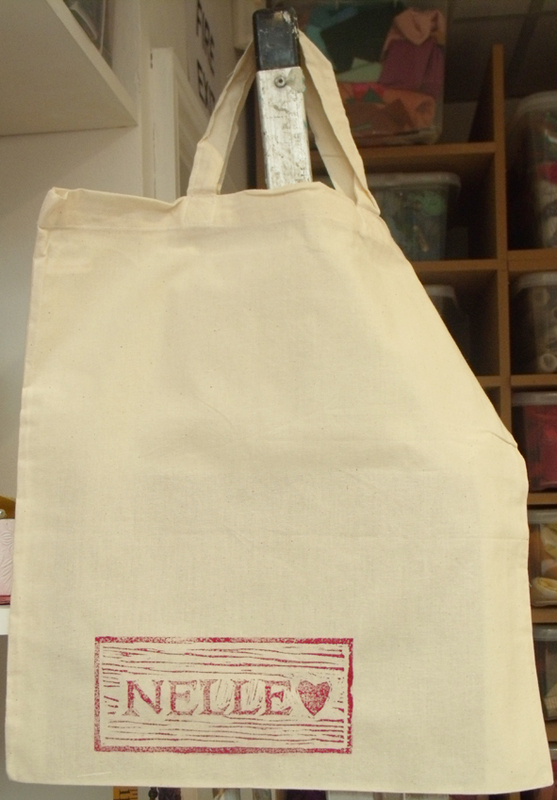 I am considering to make products to sell in the our gift shop…so watch this space. 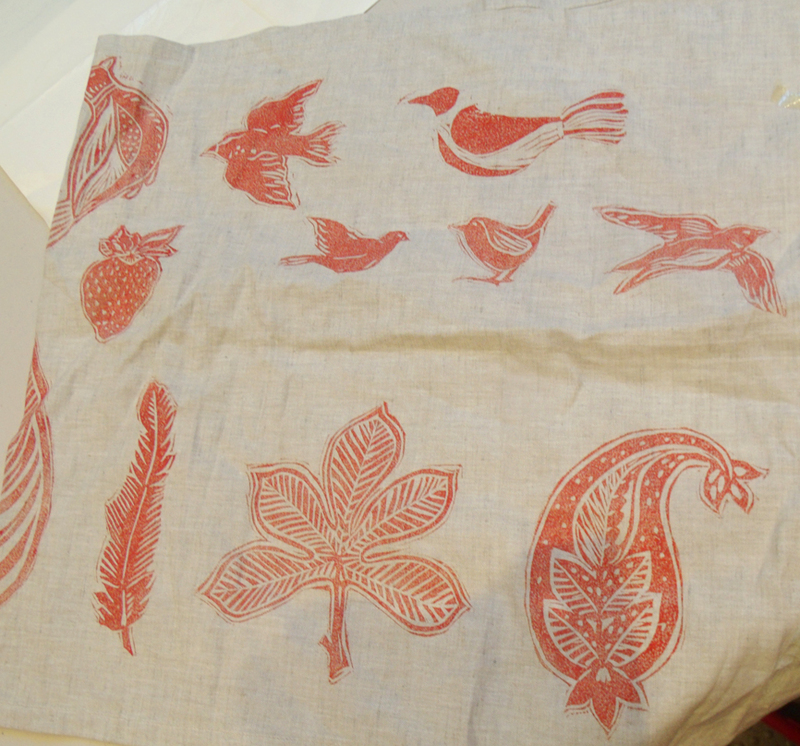 Categories: Drawing, Heart Space Studios | Tags: bird prints, heart logo, lino printing, printed linen tea towels, printing on linen | Permalink.